The Quaternaglia guitar quartet has been actively participating in the domestic and international music worlds, performing on its own or with orchestras, delivering lectures and teaching master classes in a number of cities in Brazil, Latin America and in the United States. Among the quartet’s most notable achievements abroad are its victories at the International Guitar Contest in Havana and the International Guitar Festival in Montevideo; in the U.S., the group performed in the series Guitarists of the World, Friends of Music, The American Guitar Society Concert Series and the Fort Worth Classical Guitar Society. In Brazil, among other significant events, Quaternaglia performed at the International SESC Guitar Festival, the Latin-American Guitar Seminar, the Villa-Lobos Festival, the Pará International Chamber Music Festival and the Campos de Jordão Winter Festival. Quaternaglia’s second CD, Antique, was shortlisted for the Sharp Music Prize in 1996, and the group was awarded with the Carlos Gomes Prize by the São Paulo State Secretariat of Culture, for best chamber music group of the year, in 1997. Since 1996, Quaternaglia and Egberto Gismonti have been working together towards a concept of Brazilian music for guitar quartet. This concept is exemplified by each selection in this CD. 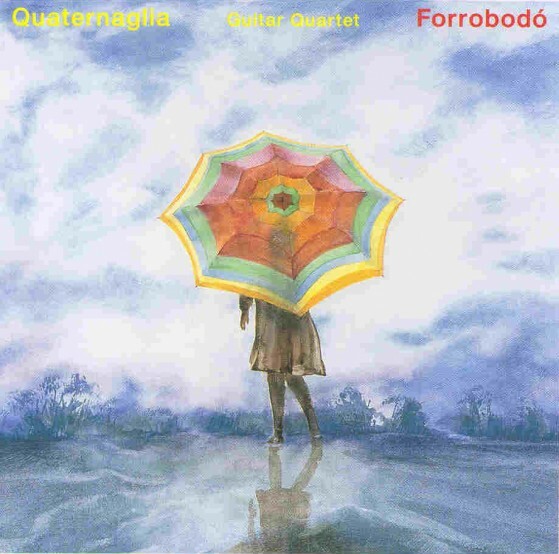 The guitar quartet, formed in the best tradition of family chamber groups, began to attain maturity with the work of the composer Leo Brouwer, written in the Eighties and fully recorded by Quaternaglia in the group’s first CD. Sérgio Assad’s Uarekena, originally written for guitar quartet, is based on Native Brazilian themes. Baião de Gude reproduces the structure of Northeastern rhythm with a strong jazz undercurrent. At times the instruments traditionally used in baião music as the accordion, bass drum, triangle, as well as voice are clearly evoked by the guitars. Furiosa is an ironic virtuoso piece in the maxixe rhythm, typical of early twentieth century Brazilian music. It is also a tribute to the small-town bands of Brazil, popularly known “as furiosas” (“furious ones”). Lun-Duos is based on multiple percussive effects, relying also on the lundu, an Afro-Brazilian rhythm. The quartet is treated here in the spirit of a desafio (musical dialogue) between various guitar duos, which gives its good-humored title. Forró and Forrobodó are doubtlessly among the most challenging pieces for four guitars. They are survival music, music of those who cannot afford to bargain with time, music of simultaneity, which leaves no room for triviality. Karatê is a swinging frevo, the most popular rhythm in the street carnival of Pernambuco. As arranged for Quaternaglia, this theme plays hide-and-seek in an intricate game of disappearance and emergence. Quartetinho is an exquisite miniature with a contrapuntal nature, based on a theme with Northeastern characteristics, “to be played as a final encore piece”, in the words of the composer’s dedication. Um Anjo, written especially for Ruy Guerra’s movie version of Antônio Callado’s novel Quarup, was arranged for four guitars by Paulo Porto Alegre. Batuque and Escovado were written by the Carioca pianist and composer Ernesto Nazareth (1863-1934), who established the form of the Brazilian tango. His works were widely played by popular pianists, choro groups and brass bands, until he was discovered by classical pianists and composers. Batuque is a “typical tango” published in 1906, which Gismonti arranged for Guitar, Piano and Orchestra. Escovado, a 1904 tango, was arranged by Gismonti for Piano and Orchestra. On the basis of these arrangements, Paulo Porto Alegre developed his version for guitar quartet. There are many advantages when one meets a guitar quartet. First of all, taking into account there was an immediate empathy, the first advantage is that we make four new friends at once. This happened to me when I met Quaternaglia! When the meeting occurs for the most obvious reason for a guitarist, that is to look for new composers so as to have new compositions, there is another advantage: four different minds asking different and instigating questions which are fourfold generous and constructive. This also occurred to me when I met Quaternaglia! And the idea that four different personalities who decide “to live” together having in mind a “marriage” that is practically impossible? This is at worst fantastic! Loneliness and individualism reign today as well as those who speak longer and louder believing their words will gather and make others understand! According to Fernando Pessoa “…to understand is to make mistakes…”. Quaternaglia, my new friends Breno, Eduardo, Fábio, Sidney, and now also João and Fernando have shown in our short relationship a silence towards understanding that is quite similar to that of sabias or hummingbirds. The beginning of this friendship has been very good. It has been so good that even without a clear demand (or suggestion) for a new composition, I couldn’t resist and I sent them two new versions of two good-tempered pieces: “Karatê” and “Quartetinho”. “Forró” was the first piece to be sent. It is a sort of endurance and musicality test. As a performer, one feels happy when the “typical Brazilian character” is visible in the middle of technical problems and one jumps to the conclusion: “the mixture is good”. I would say that “Forró” has to do with explorers who don’t know exactly what to find at the end (?) of the path, but who cannot resist the smell of bush, of wet land, traces of tapir on the road, or even the distant bark of the dog. Bravo Brazil! Life has kindly shown to me the joys and pleasures that are exclusively allowed to countrymen and wise men. Again, and this time I get four at one stroke, that is this wonderful present that is made of friendship, admiration, respect and especially of Quaternaglia’s musicality. "Forrobodó brings an inedited repertoire for four guitars, which enriches the Brazilian Music." "The CD shows the musical maturity of the ensemble and was performed with special care by the great guitarists of Quaternaglia."